We decided to treat our dog Oliver to a holiday this year, so we booked a ‘pet friendly’ cottage for a week on the Isle of Man. As we live in the North West of England this was an easy option: ferry from Heysham, on which they allow dogs on deck, and a quick drive to the cottage at the other end. Unfortunately the 70 mile boat trip from Heysham to Douglas must rank as one of the world’s most expensive ferry rides, as the return ticket for two of us plus car and dog (£5 extra) cost more than the week’s hire of the cottage, at over £360! Arriving at Douglas, we drove up through the town and on towards Glen Maye, near Peel on the western side of the island, where our cottage was located. As this was the week after the TT races, there was still ample evidence along the roads, with stacks of straw bales on most corners, and even the lamp-posts were padded. I’m not sure if a bit of straw would have much effect of cushioning a motorcycle rider hitting it at well over 100mph, but it’s better than nothing I suppose. There is still no upper speed limit on the Isle of Man outside the normal town limits, so you are free to play at being Schumacher to your hearts content, not that anybody did — we saw no evidence of it, anyway. Drivers seemed to be very courteous. A possible reason for this is that it is prohibited to take towed caravans onto the Island — bliss! The cottage was easy to find and set in the most stunning scenery. 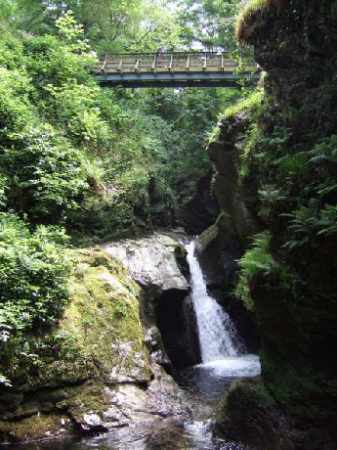 The Isle of Man is well-known for its Glens — steep wooded valleys which surround the southern half of the island. Walking out of the front door of our cottage, you could be sitting beside a beautiful crystal clear river, deep in the countryside within two minutes. There are footpaths everywhere. The Isle of Man is definitely a good place to go for walking — and we saw many locals striding out purposefully on their own along the roadsides and pathways. This could possibly be due to a poor local bus service, but as we never used one I can’t say for sure. Occasionally we’d spot a crocodile of walkers making their way along a remote path, decked out in tartan shirts, corduroy trousers and stout boots, the uniform of the determined hiker. Walking from our cottage along the main road — I mean a road that had more than 5 cars an hour! — we soon reached the village pub where we were to spend many evenings partaking of their excellent food and local cask ales. Just down from the pub is a path which leads along Glen Maye and, after about 20 minutes walking, out into a little bay on the coast where the river joins the sea. This walk is stunningly beautiful, with the river cascading down the rocks in a series of waterfalls, and flowing along a narrow gorge hung with ivy and other climbing greenery. Stand for a few minutes quietly by the side of the river and you can watch the trout swimming in the clear pools. Oliver was all for diving in and trying to catch them, but we kept him on a tight lead! The beach was mostly pebbles and usually deserted. Unfortunately it never really got warm enough to take advantage of it; yes, naturally, we picked the cold week of the summer. While I’m on the subject of weather, the Isle of Man is after all an island in the middle of the Irish Sea, so don’t expect tropical weather. It is usually mild, however, due to the gulf stream washing around its shores, but it is also rather wet. And when the clouds come in from the sea, they tend to hang around on the tops of the hills, making it very foggy when driving on the higher roads. But all that rain helps to keep the place clean, fresh and very green. The town of Peel itself is quite quaint, with very narrow winding streets in the old centre of town, a working harbour, and a proud castle standing on the headland. There are also a couple of clean sandy beaches, ideal for children. The town has a couple of shopping streets and a small supermarket a little further out of town, and there were a number of restaurants. Unfortunately most of these tended to be of the ‘and chips’ variety, and our search for an upmarket restaurant was in vain. Just a little further down the coast is the small town of Port Erin, similar in size to Peel, although probably with more shops and hotels. Mind you, once you’re in, they don’t intend you getting out again. We parked fairly centrally and had a walk around, and then along the nice sandy beach front. Returning to our car, we headed back roughly the way we’d come in, but due to a one way system and a lack of signage, it took us about 15 minutes to find the way out again, the air around our car being a delicate shade of blue by this time. Eventually released from the clutches of Port Erin, we stopped off at its close neighbour Port St Mary, which has nothing much to offer apart from a long sandy beach, a lot of rather jaded hotel fronts and about a dozen shops. At the south west corner of the island is the Calf of Man, a small island just off the mainland which is now a bird sanctuary, and trips can be had there from the mainland. Castletown is the southern most town on the Island, and is quite a bustling busy place, centered around a town square, with a good assortment of shops selling local produce. The wild boar and venison sausages we bought from there were absolutely delicious! It is however sadly lacking in one thing: a tea shop. We were gasping for a drink and couldn’t find anywhere where we could sit outside with the dog. That is one of the major drawbacks of taking your dog on holiday, it does limit your access to a lot of shops and buildings, and even pubs now that they are more like licensed restaurants. Anyway, we eventually saw a sign for a tea and coffee shop pointing down a side street, and about a 15 minute walk later we arrived at the town bowling green, which had a small café attached, serving drinks outside. Our thirst slaked, we continued on our tour around the southern half of the island, making our way back across the centre on an unclassified road my other half had found on the map. Fine, it went the direction we wanted to go in, but turned out to be single track, full of potholes and blind bends, and it reduced our average speed to about 10mph. But even on the tops of the moors where we were taken by this track, we saw many signposts for footpaths, and the occasional hardy souls making their way along them. Douglas deserves a day visit, although when we were there, we only took in the sea front and the main shopping area. This is the capital of the island and houses all the administrative buildings. There is a large shopping area with the only chain store on the island — a big M&S, which I only saw from the outside because I was on dog-holding duty. The inside was not hard to imagine! Parking on the island is interesting, because you have to have a parking disk. These are available free on the ferry, and you set the time on the disk to when you arrived so that the wardens can see how long the car has been there. 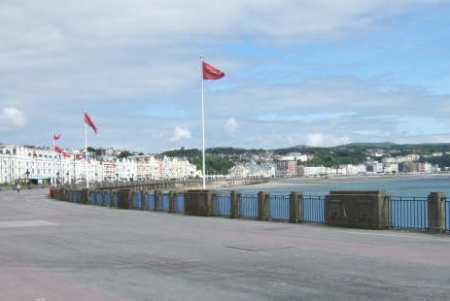 There is limited time-free parking on Douglas promenade plus a pay and display just before the ferry terminal. From Douglas you can, if so inclined, take the electric railway to Ramsey in the north of the island. This is a little two-coach affair like a tram car which runs regularly along the east coast, stopping at villages along the way. 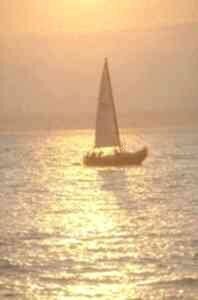 It’s a great way to see this part of the island without the hassle of driving. 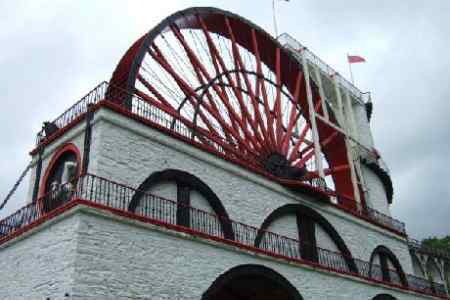 A little way north of Douglas on the railway route is the village of Laxey, with the famous Laxey Wheel, the largest working water wheel in Europe. It was built to pump water out of the nearby lead mine back in the 19th century. As fossil fuel wasn’t available on the island then, they couldn’t use steam pumps so had to make do with the only energy resource they had, which was flowing water. There is a small admission charge which allows you to climb to the top of the wheel, giving great views along the valley. It also includes a visit to the lead mine, although you only get to go in about 20 metres before it’s cordoned off. This was a pity as the mine actually extends to 26 levels below ground and was a huge undertaking in its time. Even though the wheel is still turning, and the huge crankshaft still moves back and forth along the viaduct built for it, the mine is now flooded. There are walks up to the old engine house and along the valley for those in need of exercise. But we've a dog; who needs exercise! If you should be driving south out of Douglas, you will probably cross the Fairy Bridge, and you must be sure to say ‘good day fairies’ as you cross it . If you don’t, your safety for the rest of your trip cannot be guaranteed! 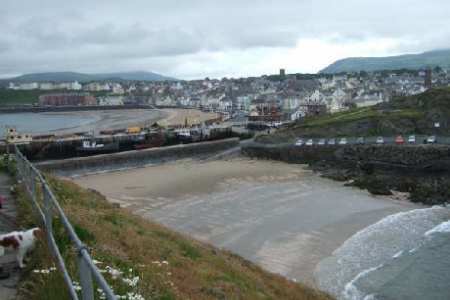 Ramsey is the second largest town on the island but has little to offer other than more shops and hotels, and a harbour. Another day, we called in at another Glen, as we’d previously bought a painting of this place and wanted to see the original first-hand as it were. This was called Silverdale, and proved to be yet another gem. By the small car park there is an old mill house which houses both a café/restaurant and a working pottery. But this is a pottery with a difference. Around the walls are many unglazed pots and jugs, and in the middle of the room are tables with paints and paintbrushes. You buy a pot, sit down and paint your own design on it, and the pottery will fire it for you to take away as a finished item later on. A wonderful idea, and it seemed as though the place was well frequented by school parties. Nearby is a playground and small lake with boats. The shop sells delicious Isle of Man ice creams in many different flavours! There is a very pleasant walk up along the glen alongside the river which feeds the lake and, yes, we found the spot where our painting had been painted some years ago. The chances are that if you’ve watched a British-made film over the past 10 years or so, you’ll have seen a lot of the Manx countryside already, as there is a thriving film industry on the island. Due to support from the local government it has been used for the setting for many films and TV dramas, and it is proving to be quite an ‘earner’ for the local economy. As we were browsing in a junk shop in Peel, the owner said that she was low on stock as the last film company had nearly cleaned her out to provide props for a film set! We loved the Isle of Man but it is not the place to go if you like clubbing and drinking. If you prefer a laid-back, quiet, relaxing holiday with wonderful views and scenery — or of course if you enjoy walking — then this is an ideal place to go. But I’d be sure to avoid the TT races fortnight. And, oh yes, do take a brolly! See also the companion guide on Isle of Man folklore. If you enjoyed reading the above article then you will probably also enjoy Sicily, also in Europe, and our latest articles covering the Orinoco Delta, La Mata, Marbella and Beijing.